Trinity Bellwoods and Queen West may have legions of fans, but when it comes to west-end ‘hoods, Worsley Urban Partners is championing the potential of a College Street corner that falls into the Little Portugal, Little Italy and Dufferin Grove neighbourhoods. 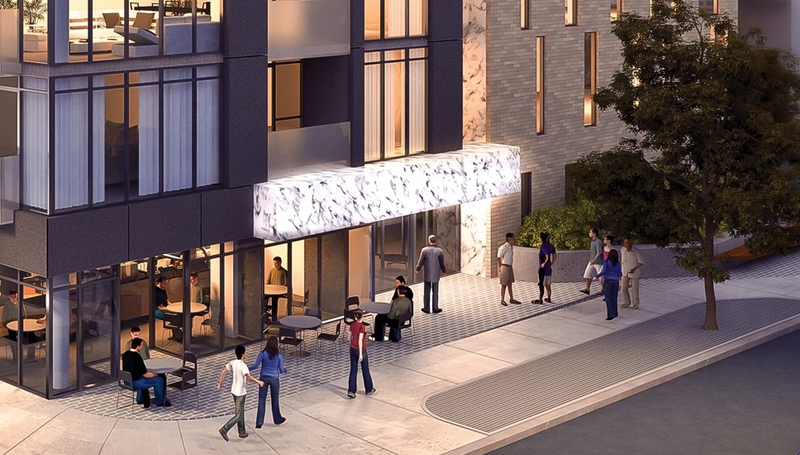 Their new mid-rise project at Rusholme and College Street, IT Lofts, is a sure sign that Torontonians are taking notice of the College Street strip. And thanks to the structure’s measured design and integration with its local surroundings, the development promises to be a good fit for the neighbourhood. “You’ve got people discovering there’s life beyond Ossington,” said Roland Rom Colthoff of RAW Design, the architecture firm tasked with designing the building. To get a better sense of just how the new condo was inspired by the area’s streetscape and architecture, we talked to Colthoff about the firm’s vision for the condo. 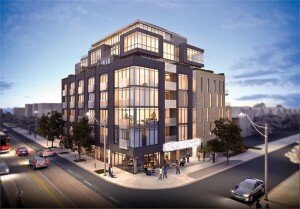 “We’re trying to fit in with the scale and the rhythm of the neighbourhood. The other projects we’ve worked on not far from IT Lofts were relatively, for lack of a better term, aggressively modernist,” he said. That led to designing four-storey tall bays, clad with fibre-reinforced cement. Little slivers of Carrara marble will run down the facade, separating the bays. Plus, there are plans to use the marble for the residential entry way canopy as well. The overall effect of the rich materials is to invoke the similarly high-end nature of the century-old homes along Rusholme Street. Another feature you don’t often see in city condos: planters on the terraces of the top floors. “We thought rather than have these big, wind-swept barren terraces that people would have to take over and modify for themselves, why don’t we provide dedicated, large-scale planters that the condominium would have available for largescale plantings in the building?” said Colthoff. It all adds up to a fairly stand-out design. But the beauty of it lies in the fact that, while it might be differ from other city condos, IT Lofts should blend right in. For more information contact clientcare@email.itlofts.com or 416 690 0101.